Magnetic compass is a navigational tool containing a magnetic needle which orients itself with the earth's magnetic field. Globally, technological advancement leading to higher consumption, rise in the demand for magnetic compass for geological survey, and increasing military expansion in Middle East & Asia are the prime growth drivers of global magnetic compass market. In addition, increase in adoption of magnetic compass for newer applications, and emerging economies such as China, India and others will create new opportunities for global magnetic compass market. However, growing counterfeit products market, and lack of efficiency in stringent and harsh working environment are the key restraints for global magnetic compass market. This report identifies the global magnetic compass market size in for the year 2014-2016, and forecast of the same for year 2021. 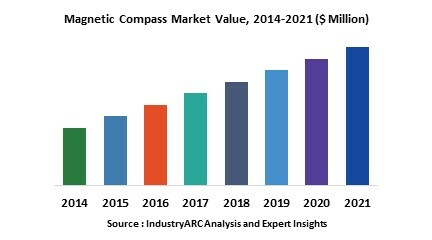 It also highlights the potential growth opportunities in the coming years, while also reviewing the market drivers, restraints, growth indicators, challenges, market dynamics, competitive landscape and other key aspects with respect to global magnetic compass market. Geographically North America dominated global magnetic compass market, and Asia Pacific is projected to have fastest growth, owing to rapidly expanding military in emerging economies such as China, India, and Bangladesh in this region. Among all the end-users, aerospace segment has the highest market share in global magnetic compass market. 18.2. AAA World-Wide Enterprises Ltd.